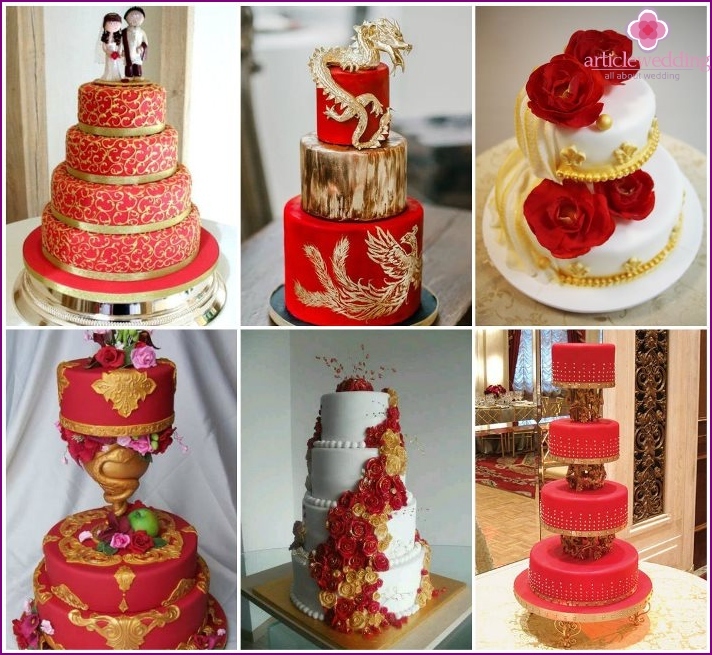 Wedding cake red color is originalview, however, this does not deprive him of beauty and appetizing - the two most important characteristics of the dessert. If the young are going to arrange a celebration in the red, the baking must comply with the chosen style. Scarlet - very energetic, bold tone, so the image of the bride shall not be less bright. It should become a modern incarnation of Carmen. 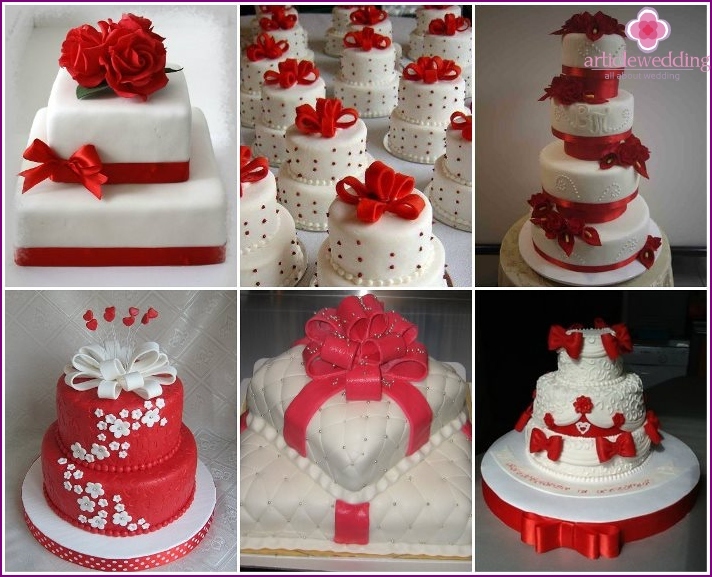 Red bright cake for a wedding is not appropriate if the young appear in the form of a gentle, humble Cinderella. 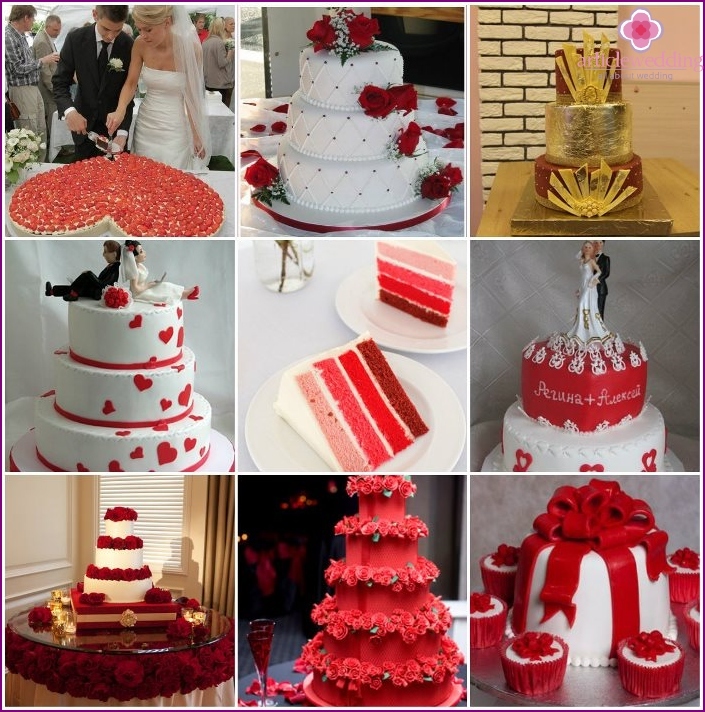 If your wedding theme providesthe dominance of red, you are presented rich possibilities for color combinations. Blue, white, green, black, cream, gold, many other colors live in harmony next to a bright scarlet or burgundy shades. 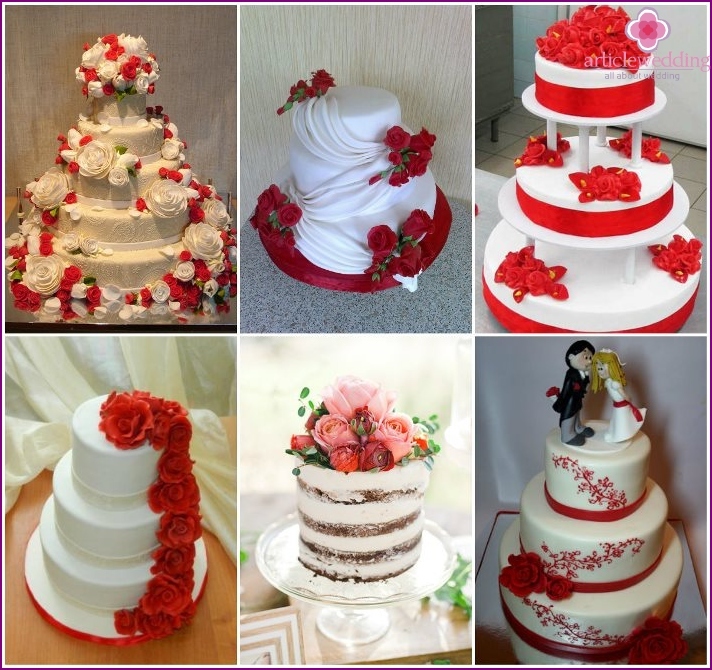 However, the most common option for the combination at weddings are the red and white colors. Fair to say that the snow-white cream on a red background gives the dessert tenderness, it dilutes the main color that would look absolutely appetizing alone. It is no secret that the flowers - a traditional,classic version of decorating wedding cakes. And the buds can be both sugar and alive. The ideal solution would be, if a variety of decorative colors will coincide with what is in the bride's bouquet. The lush peonies, elegant lilies, roses proud, delicate anemones and Ranunculus - these buds can decorate even the most modest pastries. 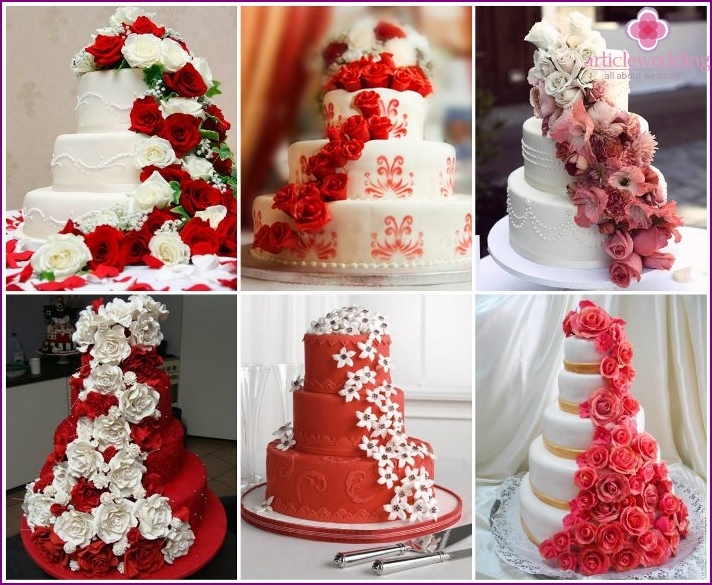 The four-classic three- or weddingdessert, decorated with colorful roses in different shades of red, will look elegant and appetizing. Interestingly, it looks unusual circular single-level product with scarlet or burgundy peony. Fans of delicate but hearty cream can order a white wedding cake with butter cream with different sorts pink red sugar flowers as decorations. If you ask a person that is a symbolany holiday, it is likely to respond - a gift. 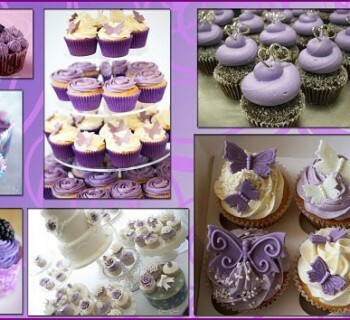 So why not book the red wedding cake for a holiday in the form of a gift box? Decorate dessert bow of mastic or chocolate in the form to sign with congratulations - and guests will be very surprised. Tied with a lush bow elegant single or multi-tiered confection will be the apotheosis of the evening. No wonder ribbons and bows are so popular forcelebrations, including weddings. They decorate the wedding dress, bridal bouquet, ballroom. Tapes used for various competitions, as the basis for the different strings, they tie up balloons. 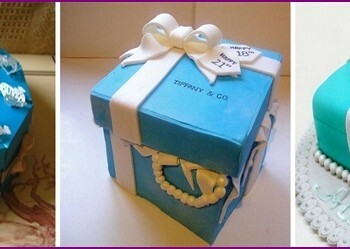 But most importantly - ribbons and bows decorate wedding cakes. Since these elements play the role of an indispensable attribute of holiday, then selecting this option decorating desserts, you are guaranteed to get the confection worthy of the best weddings. Very gently and charmingly look redcakes, decorated with floral cascades. If your wedding combines two colors - red and white, you can order dessert scarlet with flowing white buds (alive or edible sugar). 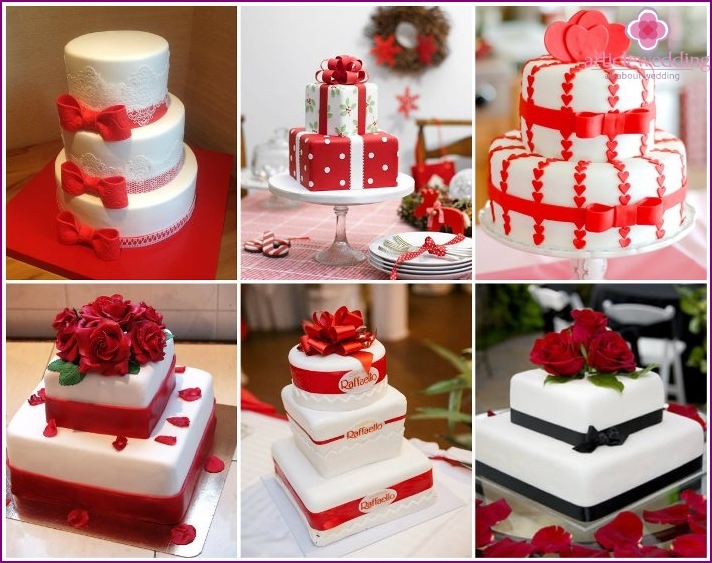 It looks tasty chocolate product with a red color, which is to buy, if the wedding design provides for a red and black colors. 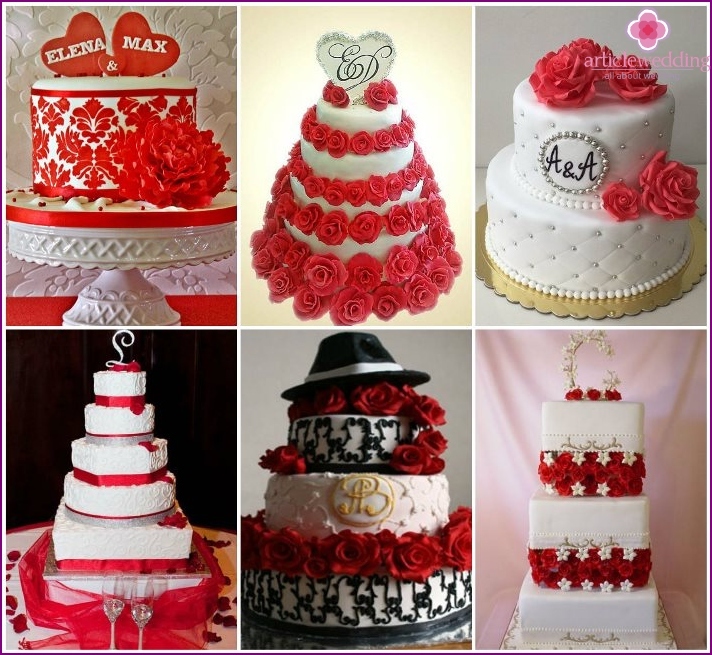 For the decoration of the wedding cake will be redrelevant elements, which are often used to create the image of the bride. It is not just about traditional painting dessert patterns and swirls, but also confectionery lace: it is prepared by a patented prescription professional pastry chefs. Executed in a technique pastry look very gentle and romantic. 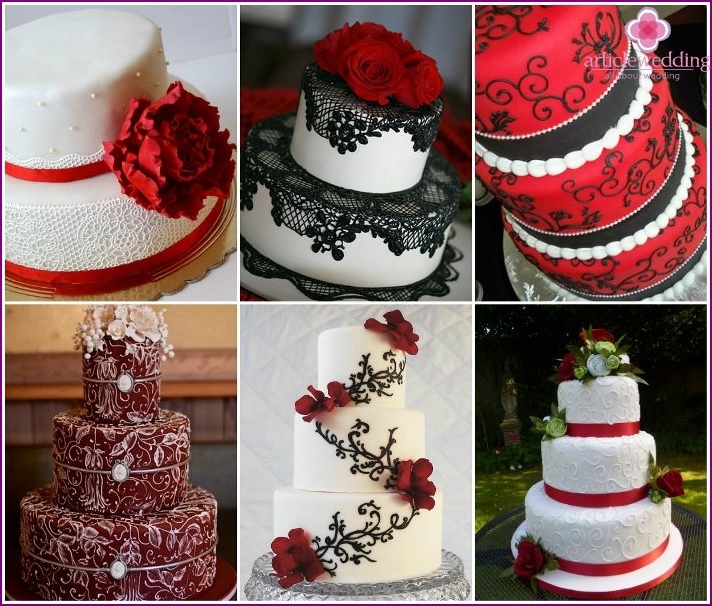 However, if you do not want to achieve lightness andtenderness, and the effect of vintage, instead of white and pastel lace patterns red wedding cake should be covered with a contrasting dark chocolate mesh. Options how to decorate the dessert there are many, each one is unique, so the young do not have to worry about what the product will look uninteresting and banal. Gold - a symbol of wealth and luxury. Therefore, the most sophisticated solution for the wedding would be dessert with golden drapery or containing elements of stylish colors. Imitation precious metal will emphasize the importance of the event. It is appropriate to such cake would look chic on the celebration. However, do not overload the whole dessert with gold, it is better to cover them is limited and only one tier, or use as a decoration specific details such as gold beads or ribbons. The red color will look great as a basis for such decor. Black tone should be used carefully toDessert did not look overly aggressive. Its overload can discourage visitors to try baking. 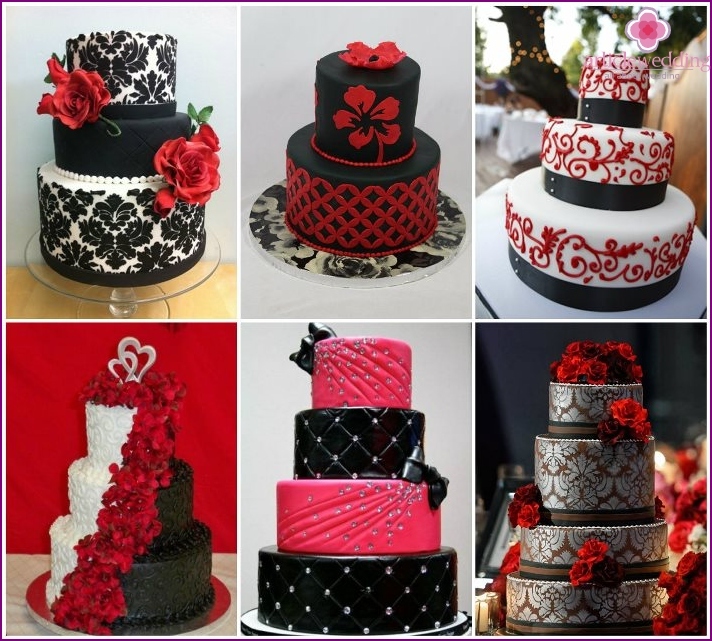 A perfect solution would be a dark chocolate thin mesh on one or more tiers of a wedding cake. Beautifully will look gentle dark patterns on a red dessert. To spice you can add to the composition of strawberries in chocolate. Words and writing - a great idea for decoratingwedding cake, for dessert they add individuality. For example, you can ask to make a pastry cream with white lettering on a red background "wife and husband", write your name, initials or nicknames funny that you call each other. This will create a good mood, not only your own, but also the guests. The alternative will provide the words that may put on a wedding cake with the help of skewers, toothpicks or stretching. Such decoration - a simple, original and symbolic. 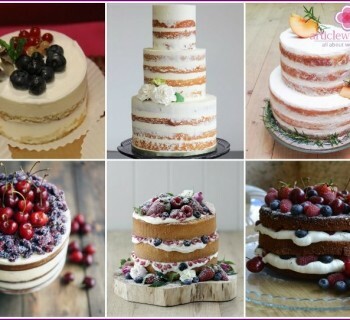 Some couples pay a great attention to the choicewedding cake, while others - no, but the first is still more. Hollywood celebrities believe that the confection should attract everyone's attention, not to shine less brightly than diamonds in engagement rings. For many of us a wedding cake - something more than dessert. His appearance, flavor characteristics, time of cutting - it's all very symbolic, so it must be not only beautiful and elegant, but still original.